占王忠, 彭清华, 陈文彬. 羌塘盆地冬曲地区上三叠统巴贡组古网迹的发现及古环境意义[J]. 地质通报, 2019, 38(2-3): 208-212. Zhan W Z, Peng Q H, Chen W B. 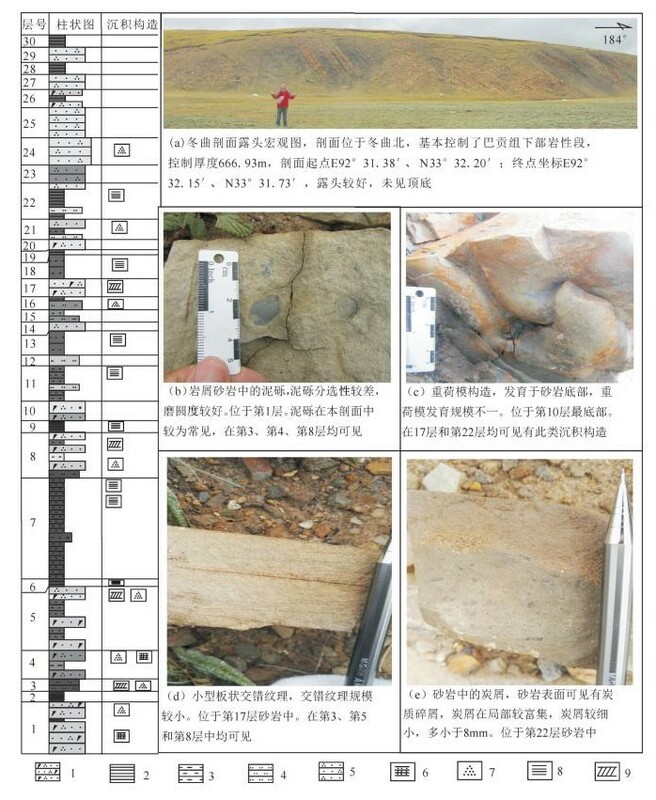 The discovery of Paleodictyon in Upper Triassic Bagong Formation in Dongqu area of Qiangtang basin and its palaeoenvironment significance[J]. Geological Bulletin of China, 2019, 38(2-3): 208-212. 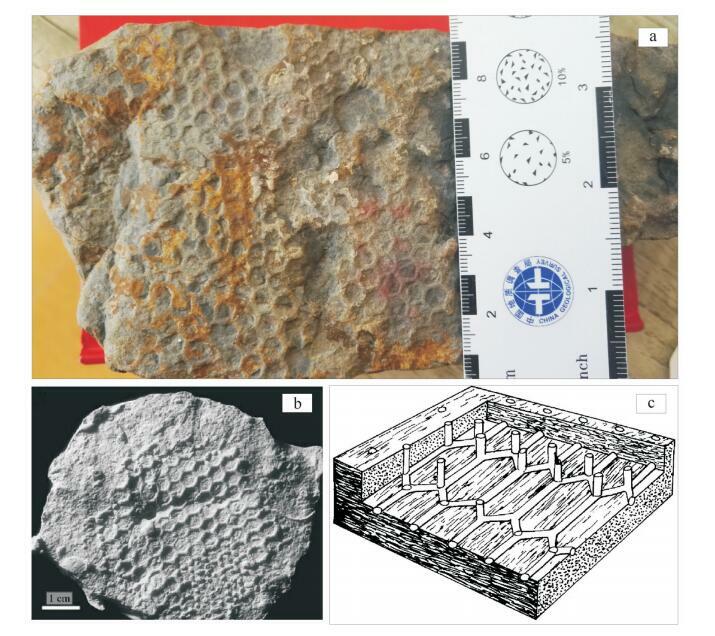 Abstract: Paleodictyon trace fossils were found in Upper Triassic Bagong Formation in Dongqu area of Qiangtang basin. The authors confirmed that they belong to P.(Glenodictyon) Vander Mark. 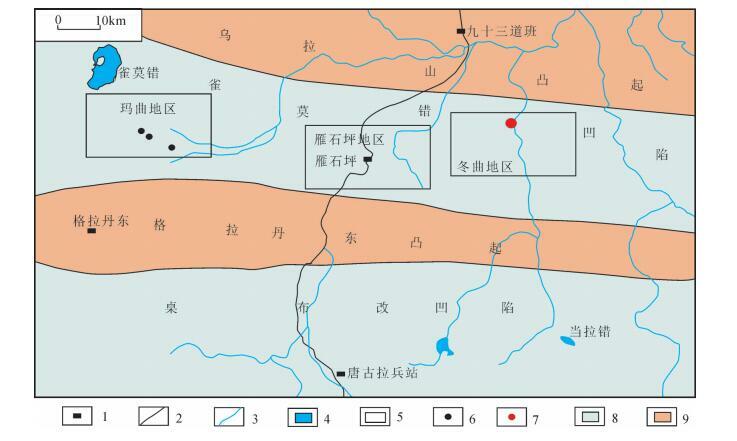 A comparison with relevant information available shows that the palaeoenvironment of Dongqu area in east Qiangtang basin belonged to deep-sea, low oxygen and high salinity flysch sedimentary environment in Late Triassic. The results obtained by the authors are of significance for environmental analysis and lithofacies paleogeographic pattern study. 杨式溥, 张建平, 杨美芳. 中国遗迹化石[M]. 北京: 科学出版社, 2004: 81-85. Mccann T, Pickerill R K. Flysch trace fossils from the cretaceous kodiakfomation of Alaska[J]. Palacont, 1988, 62(3): 330-348. 晋慧娟, 李育慈, 方国庆. 中国古代深海沉积和遗迹化石群落[M]. 北京: 科学出版社, 2003: 30-41. Chamberlain C K. Bathymetry and paleoecology of Ouachita Geosyncline of southeastern Oklahoma as determined from trace fossils[J]. Amer. Assoc. Petrel. Geol. Bull., 1971, 55(1): 34-50. 齐永安, 胡斌, 张国成. 遗迹学在沉积环境分析和层序地层学研究中的应用[M]. 徐州: 中国矿业大学出版社, 2001: 20-24. 王剑, 丁俊, 王成善, 等. 青藏高原油气资源战略选区调查与评价[M]. 北京: 地质出版社, 2009: 164-422. 王剑, 谭富文, 李亚林, 等. 青藏高原重点沉积盆地油气资源潜力分析[M]. 北京: 地质出版社, 2004: 32-34. Seilacher A. Trace fosilanalysis[M]. Berlin: Springer-Verlag Berlin and Heidelberg GmbH &CoK, 2007: 156-158. Ekdale A A, Bromley R G. Comparative ichnology of shelf-sea and deep-sea chalk[J]. Jour. Paleontol., 1984, 58: 322-332. Ksiazkiewicz M. Bathymetry of the Carpathian flysch basin[J]. ActaGeol. Palonica, 1975, 25: 3-17.